The information here is only a guide and is subject to change by Parking Services. 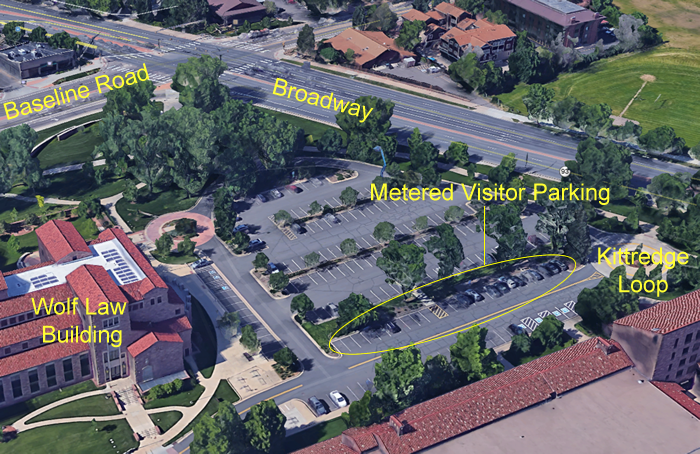 For the most current information about parking on campus, see the University of Colorado-Boulder Visitor Parking webpage. Short-Term Visitor Parking -- Pay To Park visitor spaces are located at the south and north ends of Lot 470 (on the west side of the Wolf Law Building). The rate is $1.75 per hour; 2 hour maximum; payment with coin or credit card. Subject to special events parking restrictions. Pay To Park visitor spaces are enforced 7:30 a.m. - 5:00 p.m., 7 days a week. All-Day Visitor Parking -- Longer-term Pay To Park visitor spaces are available in Lot 306, located on Regent Drive (across from Regent Hall) just east of Broadway. The rate is $1.75 per hour; 10 hour maximum; payment with coin or credit card. Visitors may park for free after 5:00 p.m. Monday through Friday and all day Saturday and Sunday in the permit spaces of Lot 470 (on the west side of the building) and Lot 402 (on the east side of the building). Subject to special events parking restrictions. Pay To Park visitor spaces must be paid 7:30 a.m. - 5:00 p.m. on Saturday and Sunday. Campus parking is free when university offices are closed on a holiday unless posted signs say differently. Meters for persons with disabilities are located on the west and east sides of the Wolf Law Building. A state issued disability license plate or placard must be displayed. The rate is $1.75 per hour; 10-hour maximum; payment with coin or debit card. Meters must be paid from 7:30 a.m. to 5:00 p.m., 7 days a week. Metered service & delivery parking are located on the west and east sides of the Wolf Law Building. The rate is $3.00 per hour; payment with coin or debit card. Enforced at all times. If you receive a parking citation, please direct any questions to Parking Services. They are located in the Campus Police building at 1050 Regent Drive and can be reached at (303) 492-7384.